Our Sterling Silver Celtic Crucifix 24" Chain features our money-back guarantee. 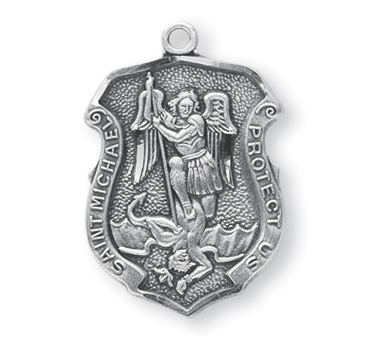 Our Sterling Silver St Michael with 18" Chain features our money-back guarantee. 11/16" Sterling Silver Miraculous Medal Made in the USA. The Oval Shape Fancy Border is Adorned with finely detailed Blessed Mother Mary with rays coming out of her extended hands. The Reverse Side of the Medal Portrays an "M" with a Cross on the top and the "Sacred Hearts" underneath surrounded by Twelve Stars. 1-1/16" Sterling Silver Portrayal of St. Joseph holding Baby Jesus. He is the Patron Saint of Carpenters, Married Couples, Workers. This Sterling Silver Oval Shaped St. Joseph Medal is made in the USA. 1-1/16" Sterling Silver Portrayal of St. Barbara with a Chalice and Sword with Palms. She is the Patron Saint of Prisioners, Architects. This Sterling Silver Oval Shaped St. Barbara Medal is made in the USA.